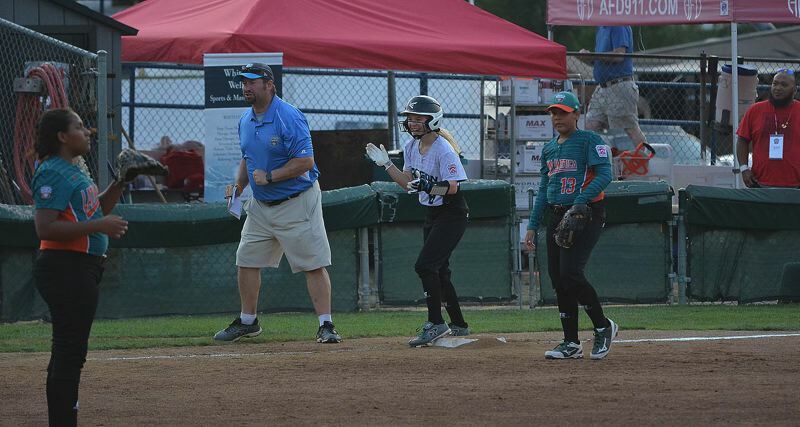 South Beaverton's bats, quiet and quaint through the first two pool play games of the Little League Softball World Series, came alive at the opportune time. In need of one more triumph to secure one of the Pool B's four automatic bracket spots, Oregon District Four erupted with 12 total team hits from nine different players and scored seven unanswered runs in the third and fourth innings to put away Team Latin America 11-4 on Friday at Alpenrose Stadium. South Beaverton dropped its final pool play game against Team Central on Saturday, but secured Pool B's third seed and guaranteed the ODF champions would be on ESPN2 against Team East on Monday. Should ODF upset Team East, it'll most likely face Team Southwest in a rematch of the LLSWS's first pool play game. "This is good momentum for us," ODF head coach Brenda Peterson said. "I think the girls felt more success from tonight and it'll hold. We have to take this success and keep it rolling. I never expected us to win the LLWS. I expected us to show well and be competitive and represent our hometown little league and build the program and atmosphere and the excitement for softball in our area. The dream has come true, I just want it to continue as long as possible for our league." The outpouring of hitting was a far cry from what ODF produced in the first two games of pool play. ODF was held to just eight hits combined in two contests against Southwest and Asia-Pacific but found its batting eye facing a Latin America team that couldn't keep South Beaverton off of the bases. Erica Eidson, Amanda Peterson, and Lizzy Bradford each bagged two hits apiece. Bradford and Peterson both notched a pair of RBIs and first baseman Hailey Stutzman led ODF with three RBIs. "Hitting really is contagious in the box," Brenda Peterson said. "A lot of it is visual. Seeing someone else can hit the pitch that's on their team and they feel they can do it, too. They've always had this (hitting ability). Some games it gets buried, like it did yesterday (against Asia-Pacific) and now it's come out again. Hopefully, we'll continue it." Eidson not only tied for the team's game-high in hits, but she was also lights-out in the circle. The southpaw threw all six innings, allowing just five hits and one earned run in a critical appearance. Whereas starter Amanda Peterson is more of a power pitcher who can blow through opponents, Eidson's variance in pitches and speeds limited Latin America's potency. "Erica's left-handed finesse makes her special," Brenda Peterson said. The strings of hits that propelled ODF to this platform during the regular season and district tourney resurfaced in spades against Latin America. And while nerves might have shackled South Beaverton's bats in the first two games, the all-stars were right at home teeing off on the Latin American staff. 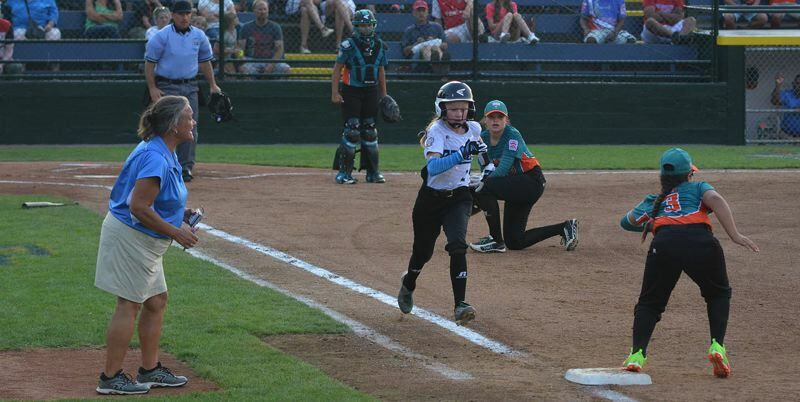 Playing the late game on a Friday night under the bright lights before a packed, pro-South Beaverton crowd, ODF looked immune to any sort of mythical pressure that crops up as the LLSWS unfolds and the contests begin to carry more weight. In the top of the third, with the game knotted up at 2-2, Ashley Goodale walked to lead off the stanza. Kendall Stout planted a perfect sacrifice bunt on the infield dirt while Goodale got on her horse and bolted safely into third under the Puerto Rican tag. After Stout and Goodale did their jobs, Bradford fulfilled her duty as well, lifting a lofting fly ball that carried all the way to deep center and scored Goodale to go up 3-2. And Amanda Peterson kept the pressure on by cutting a RBI single to right to extend ODF's edge to 4-2. Eidson singled and stole second to lead off the fourth, then Rachel Powers moved her over to third with a single to right. She too stole second to set up runners in scoring position with nobody out for Erica Frainey. The lefty clubbed a ball right at Puerto Rican third baseman who couldn't handle the heat and didn't get off a throw to first as Eidson scored to make it 5-2. And Goodale singled to left to load the bases. "Anytime you get runs early, it takes pressure off of the girls and the pitcher," Brenda Peterson said. Bradford hit a sacrifice fly to right to extend the edge to 6-2. And Peterson prolonged the party with a RBI single to left, 7-2. Elli Higginbotham walked with the bases loaded to bring in a run, 8-2. And Peterson played a wild pitch off the Alpenrose backstop superbly, scooting home at the first sign of Puerto Rican battery trouble to push it to 9-2. In the fifth, Alaina Baseleon reached on a two-out single; two batters later, Stutzman walked with the bases loaded to move ODF into double digits, 10-3. And finally in the sixth Eidson tripled, and Arbow brought her home with a RBI single to make it 11-3.